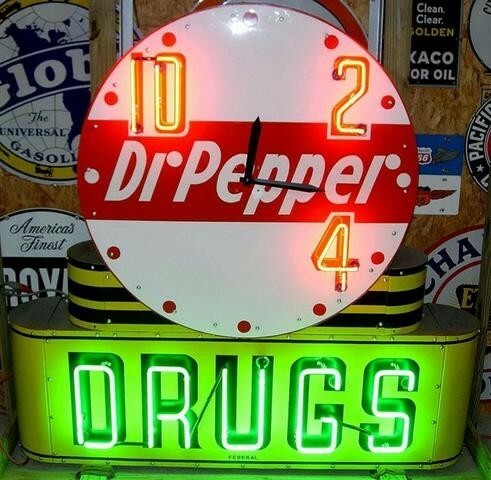 A rare sign indeed, this Dr Pepper Neon Clock is 61″ tall. The diameter of the clock is 42″ while the width of the bottom half of the sign is 49″. The clock portion of the sign shows three numbers: 10, 2, and 4. Through the center of the clock is text that reads “Dr. Pepper.” The clock is mounted on top of a base. The base says “Drugs” in bright green neon letters. The sign is 12″ deep overall and looks great when lit.